Dealing with any type of rodent in your home is cause for stress and frustration. You don’t know how long they’ve been there or how much damage they’ve done, and you may find yourself desperate to get rid of them by any means necessary. However, the first thing you need to do before you ever try to handle a nuisance pest is take a breath and think logically about the method you choose. The majority of rat poisons are anti-coagulants mixed with other chemicals. The chemicals make the blood vessels weak and cause internal hemorrhaging. With the anticoagulant preventing the blood from clotting, the rodents die within one to two days. Another type of poison is a phosphide that reacts with stomach acid to create a toxic gas, killing the rodent usually within 2 days. A third is calciferol. When ingested, calcification occurs on many organs in the body and can take up to a week for the rodent to die. All three of these are very slow and painful processes for the rodent, and there are many better ways to go about handling a rodent problem. While they are both in the Rodentia family, rats and squirrels have very different diets. Rats are very much creatures of opportunity, eating just about anything that’s available while focusing on high protein items. Rat poison takes this into consideration and utilizes an attractant such as peanut butter, fish oil, or ground meat. Squirrels, on the other hand, are not nearly as attracted to those smells as their diet consists of more plant-based items. And, while squirrels may like peanut butter occasionally, they prefer full nuts. On the off chance the attractant does work, and a squirrel ingests the poison, you will be left with the strong odor of a dead squirrel carcass somewhere hidden in your home. Another problem with using any kind of poison in your home is when there are small children or other pets in the house. The pellets often look enticing to dogs as they often smell appetizing and can look similar to dry dog food. For young children, it is often a matter of curiosity. Children like to put things into their mouths, and you definitely don’t want a child ingesting poisons. In short, the answer is no, you shouldn’t use poison on squirrels. There are many other methods that are safer, more humane, and more effective. 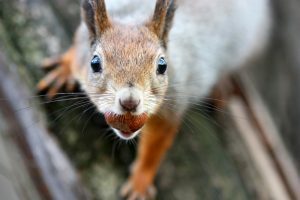 If you are having a squirrel problem in your home, give Critter Control® of Miami a call. We’ll set up a free inspection to help assess the severity of the issue and then walk you through all of your options. Contact us today to get started.